The Card Case is designed be as attractive as it is functional. 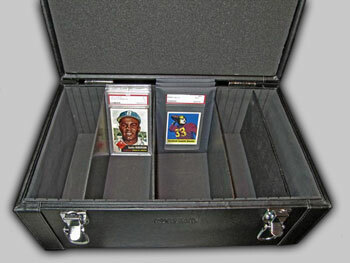 Finally, a storage case designed specifically for storing sports-cards. Designed from the ground up, providing collectors a quality alternative to cardboard boxes. Made from durable, scratch resistant materials and hand assembled to ensure high quality craftsmanship and durability. No more scratches! A high-end alternative to sloppy, plastic card sleeves. 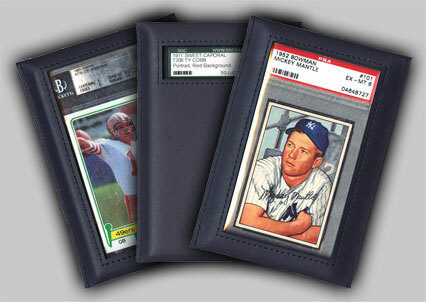 The offered bags are specially designed to hold graded cards slabbed by PSA, SGC, GAI, and BVG. Two different designs are available (small and large window). A high quality product with hand-stitching and precision cut materials.